A deceptively simple Bunraku puppet show from the U.K.'s Blind Summit Theatre almost imperceptibly becomes a religious allegory. 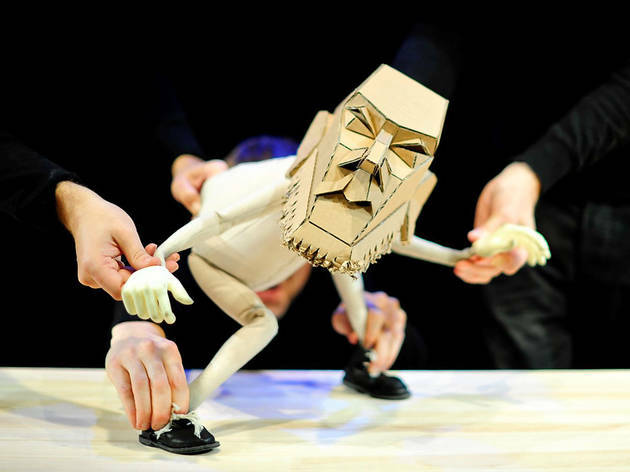 This cheeky piece from the U.K.'s Blind Summit Theatre, imported as part of Chicago Shakespeare's World's Stage series, centers on a self-aware Japanese Bunraku puppet with a cutely curmudgeonly-looking cardboard head. 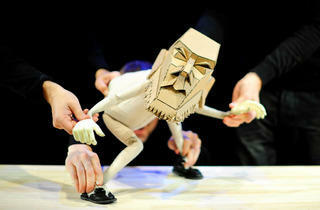 The puppet is controlled by three operators working in impressive tandem to give him, the puppet, the illusion of life by imitating the three central tenets of focus, breath and fixed point, all while he, the puppet tells us repeatedly, is confined to the plane of the small table that serves as his stage. Oh, and he—the puppet—says he intends to act out for us the last 12 hours of the prophet Moses' life, in real time. All of this is true, at least as set-up for Blind Summit's The Table. But this is a piece that's both deceptively simple and simply deceptive. The three puppeteers manipulate their little Moses with marvelous skill, to be sure, and in the course of their—his—narrative, they entertainingly pass on those animating principles of this style of puppetry, with Moses always openly acknowledging his manipulators; in one neat bit, the cast demonstrates convincingly that the puppet persona lives a separate life from the puppet body. And somewhere in here, in the references to Moses' death at the hand of God in Deuteronomy 34—and the suggestion that God, having sent his prophet to perform all the signs and wonders in Egypt, now required Moses to take dictation of the record of his own demise—there's an allegory about the roles of deity and messenger. For all the puppet's protestations that he's confined to his table, he's really able to—and bound to—go where his makers make him. This is all well and good, and it's appreciated that Blind Summit doesn't hammer it too hard. And yet one sequence involving a sleight-of-hand to suggest, perhaps, our controllers' ultimately fallible, possibly even improvisational nature goes on long enough to make one begin to think the performers have lost control of the show, then further long enough to have you annoyed at being toyed with; the guests at The Table have ever so slightly overstayed their welcome.